Though it may seem like a story from a bad movie script, infant abductions from the hospital make headlines almost every day. So just what protocols are in place to protect your newborn? The new mother-to-be looks at me quizzically before she extends her hand for me to stamp her fingerprint on our hospital’s paperwork. We’ve all heard horror stories about newborn abductions from hospitals or watched the Lifetime movies when a woman dresses up in scrubs and steals a baby in broad daylight. But the truth is, the security for newborn safety is high in most hospitals and birth centers. 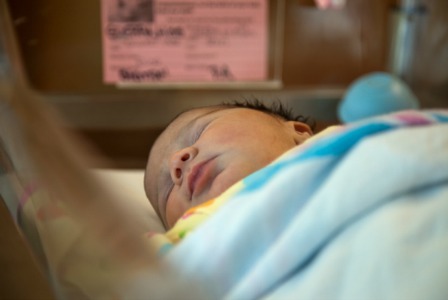 Many hospitals operate with strict newborn safety protocols, including locked units, constant video surveillance and wristbands that will set off an alarm if the baby is taken off of the labor and delivery unit. For instance, at our local hospital there is no direct access out of the unit—every person is screened before they are let out of the unit through a locked elevator door. Even in small facilities, there are constant warnings for “suspicious persons” — people who fit the profile of infant abductors — generally women who claim to be pregnant when they are not or who ask to “just look” at the newborn babies. But while the FBI reports that heightened newborn security in hospitals has helped reduce the rates of newborn abduction, in a frightening turnaround, the heightened security has driven some desperate women to more extreme measures — like violence or searching social media for local babies. One study in the American Journal of Nursing found that in actuality, more newborns were abducted from their homes than hospitals. So what can you do to protect your newborn baby? At the hospital, don’t hesitate to ask any person who comes into contact with your baby for identifying information — all employees should clearly identify themselves according to hospital protocol and explain exactly what procedure or tests that they are performing. If it makes you feel more comfortable, ask for any testing to be done in your room or accompany the nurse or tech for your baby’s tests. There are very few tests that your baby needs that you could not accompany him or her to. The FBI warns that parents should be extra cautious with people who seem overly interested in their baby, even when out and about in public. It may seem over-protective, but trust your mom instincts and avoid contact with anyone who seems to pop up in suspicious places or constantly harasses you to see your baby. Did you know that all those pictures you are posting online of your precious bundle of joy can actually contain tracking information that will show your exact location via GPS coordinates? According to CNN, most sites, like Facebook, strip photos of their identifying information, but some photo sharing sites, like Flickr do not. The best thing to do is to check your settings or run it through software like Photoshop that can clear your pictures of any location-tracking information. Because most abductions happen within the first 10 days of life, consider staying home or avoiding broadcasting your baby’s birth announcements all over the internet for a while. It’s a feat that seems almost impossible to do, but definitely warrants consideration. All in all, rest assured that your baby will be safe in the hospital. But don’t be afraid to speak up and be an involved participant in your newborn’s safety.